In the fall of 2009, the food world was rocked when Gourmet magazine was abruptly shuttered by its parent company. No one was more stunned by this unexpected turn of events than its beloved editor in chief, Ruth Reichl, who suddenly faced an uncertain professional future. As she struggled to process what had seemed unthinkable, Reichl turned to the one place that had always provided sanctuary. "I did what I always do when I'm confused, lonely, or frightened," she writes. "I disappeared into the kitchen." My Kitchen Year follows the change of seasons--and Reichl's emotions--as she slowly heals through the simple pleasures of cooking. While working 24/7, Reichl would "throw quick meals together" for her family and friends. Now she has the time to rediscover what cooking meant to her. Imagine kale, leaves dark and inviting, saut ed with chiles and garlic; summer peaches baked into a simple cobbler; fresh oysters chilling in a box of snow; plump chickens and earthy mushrooms, fricasseed with cream. Over the course of this challenging year, each dish Reichl prepares becomes a kind of stepping stone to finding joy again in ordinary things. The 136 recipes collected here represent a life's passion for food: a blistering ma po tofu that shakes Reichl out of the blues; a decadent grilled cheese sandwich that accompanies a rare sighting in the woods around her home; a rhubarb sundae that signals the arrival of spring. Here, too, is Reichl's enlivening dialogue with her Twitter followers, who become her culinary supporters and lively confidants. 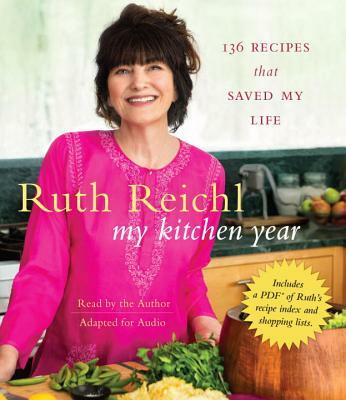 Part cookbook, part memoir, part paean to the household gods, My Kitchen Year may be Ruth Reichl's most stirring book yet--one that reveals a refreshingly vulnerable side of the world's most famous food editor as she shares treasured recipes to be returned to again and again and again. Ruth Reichl is the bestselling author of the memoirs Garlic and Sapphires, Tender at the Bone, and Comfort Me with Apples and the novel Delicious! She was editor in chief of Gourmet magazine for ten years. She lives in upstate New York with her husband and two cats. From the Hardcover edition.